After a two year hiatus, it was finally time for the next leg of the Munda Biddi! 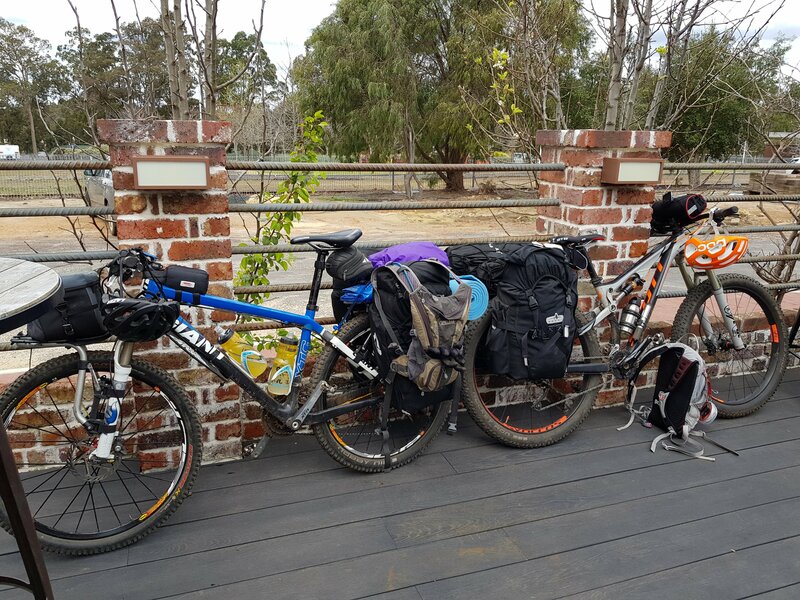 Last trip we had finished in Nannup, so this time we started in Nannup and the plan was to go through to Pemberton. 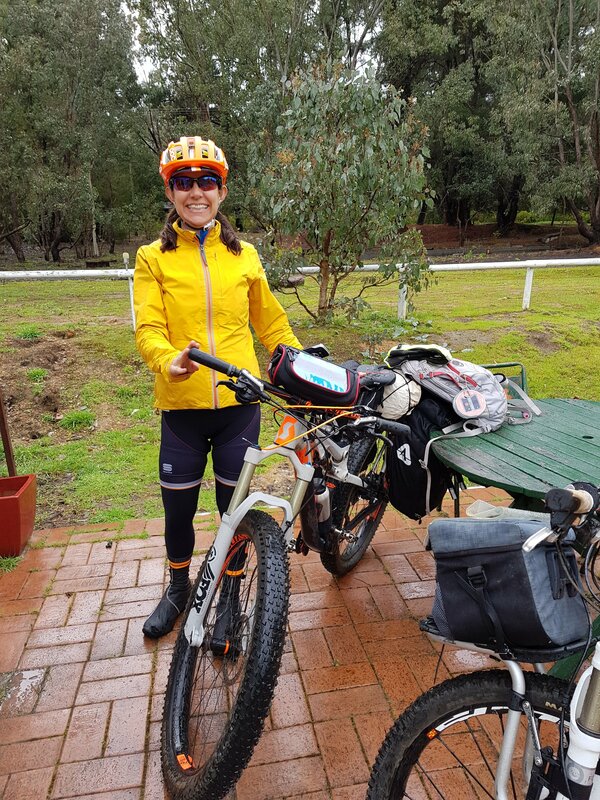 We arranged with Pemberton Discovery Tours* to transport us and our bikes from Pemberton to Nannup, so that we could just drive one car and park at our finishing point. The drive down from Perth was very rainy and windy, and that didn’t change too much when we arrived. Our transport to Nannup went smoothly. We got dropped near a cafe with our bikes and all our bags, then proceeded to load everything onto the bikes. Thankfully we had packed everything onto the mini bus and it all fit onto the bikes! Then into the cafe for lunch. 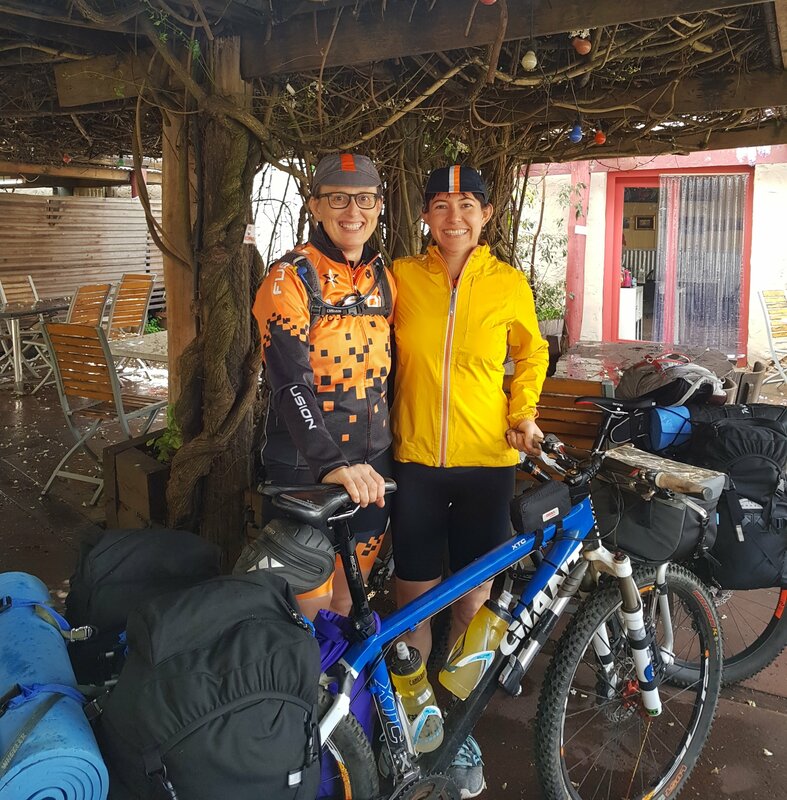 The lovely cycling- friendly owners of the Blackwood Cafe took our photo before we left, and we had chats with numerous locals who thought we were crazy/ brave/ adventurous for heading out bush in the rain. * I’ve added hyperlinks to businesses that treated us well and we would recommend. 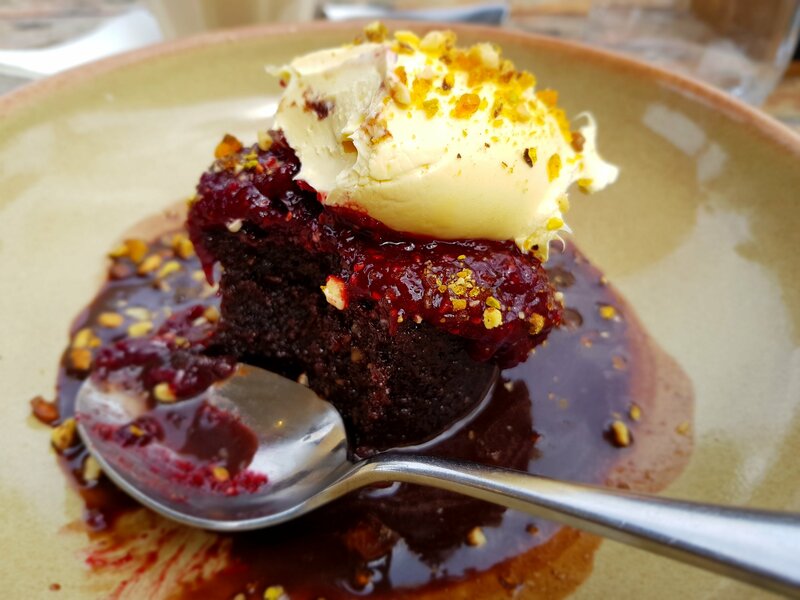 This is to share the love with businesses who are doing good things, and with fellow travellers who may follow in our wheel ruts. After waiting through one brief heavy rain shower, the sun came out so we figured it was a good time to leave! We were on schedule, leaving at 2pm. 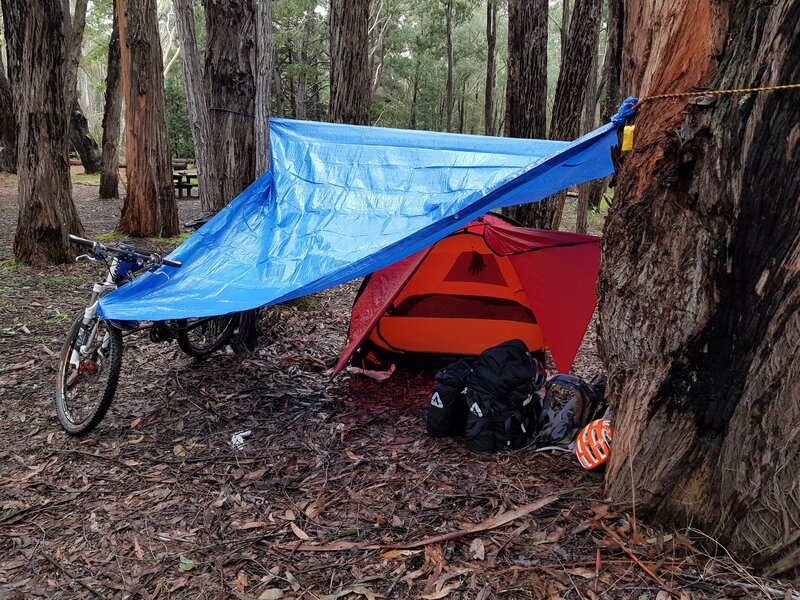 The plan was to ride 15km to a Bibbulmun camp site and stay there for the night. So away we went, down the main highway to start with. A couple of brief stops to adjust bags and put more air in tyres, then we settled in to the ride. We quickly turned off the main road onto a quiet country road, which remained bitumen for a while then became a dirt road. In a common theme for the trip, the “flattish easy” profile depicted in the Munda Biddi map would actually lead to undulating terrain with not insignificant up and down hills, but at least they were not seriously steep or technical climbs. After 15km we started looking out for the camp site. No sign yet…. surely it is around here? After a while, I stopped to check that we hadn’t accidentally passed it, and no it was still a little way down the road. Another 10 min of gravel road and we see the sign – hooray! But wait, where is the hut? Tent plus tarp setup at Willow Springs. Yes the bike is an integral part of the tarp support! Dinner was rehydrated homemade lamb stew and mashed pumpkin. Yum! We were halfway through dinner prep when a car arrived. Five people and a stack of gear tumbled out and they set up two mini tents on the other side of the camp site, then established themselves around one of the fire pits. That was the end of our peace and quiet for the evening. We retired to bed by 7:30pm and got to sleep ok, but were woken again by 9:30pm as the talking and laughter from the fire pit got louder. It seems the noise increased in parallel with the beer consumption. We didn’t get much more sleep until they finally shut up sometime after 11pm. We were camping out bush to get away from this kind of stuff! The first task of the morning was to find some water to wash our pots and pans from the night before, fill up the kettle for coffee and replenish the camelbaks. Good thing we were camped near a river as there were no water tanks at this camp site! So a 10 min walk to find an accessible riverbank, then back with clean pots filled to the brim with fresh water. Breakfast was porridge or muesli with powdered milk then coffee freshly made with the aeropress. We tried to make as much noise as possible to pay back the tourists from last night. They got up, packed up and took off pretty quickly, which suited us! 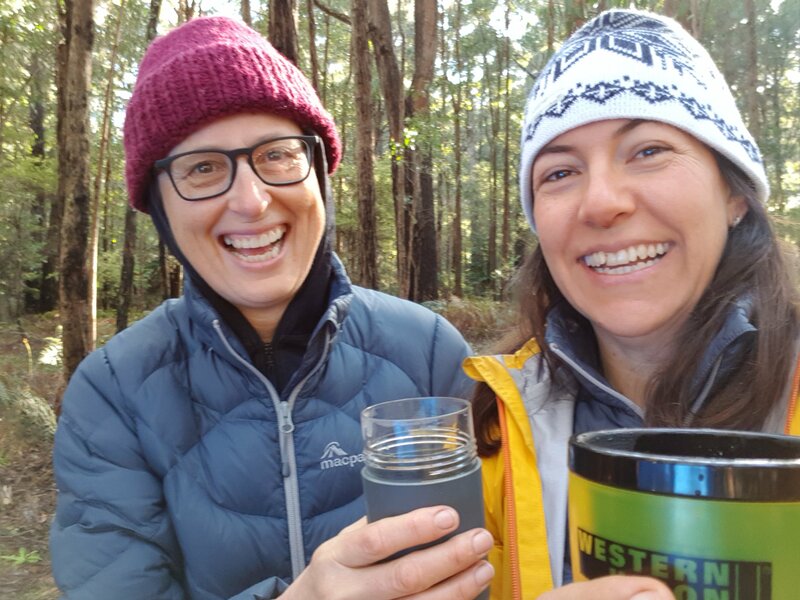 Coffee in the bush, happy days. Cold, what cold? So away we go. After being on road and gravel road for the previous afternoon, today the trail changed immediately to a mountain bike trail – nice! Not singletrack but definitely more trees and more twisty. 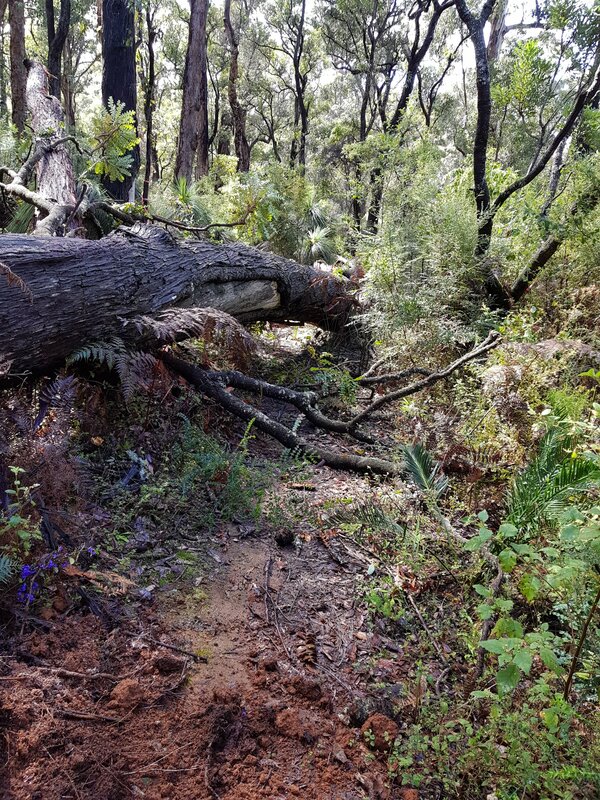 We discovered the problem with this, particularly after some rough weather in the past few weeks, was that quite a few trees had fallen onto the trail. 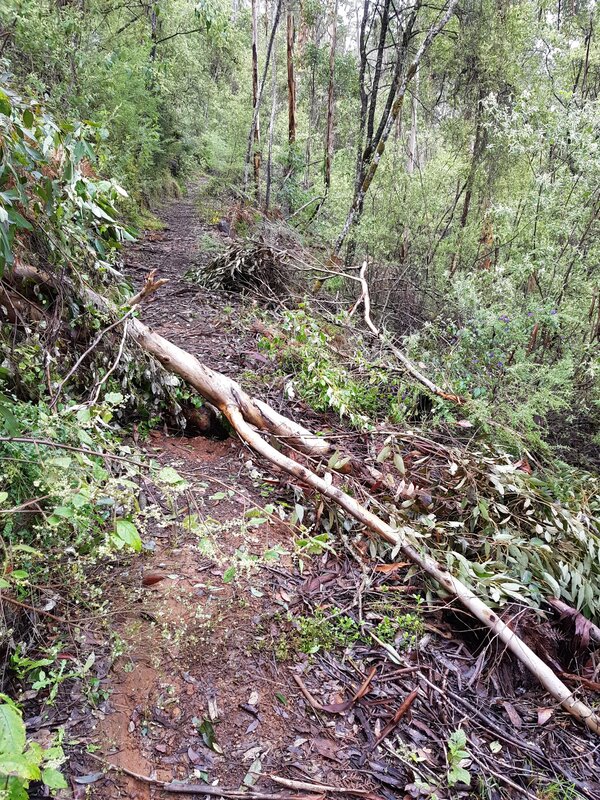 Some of them were smallish trees that could be cleared off the trail with quite a bit of determination, and some of them were large trees that we had to either find a path around (bush bashing) or go over (with bikes + luggage weighing around 35kg). Our average speed was significantly reduced by the amount of time we spent clearing the trail or getting around or over trees (I don’t use auto pause on the mountain bike as I still want to capture the sometimes significant time spent walking!). We averaged 8kph for 36km today, a total of 4.5 hours. There is a trail under there somewhere. Can we move the log? No. Can we go over the log? No. Have to go around the log. Along the way, we stopped at Donnelly River cafe around 12pm for a coffee and snack. If you are ever in the area they do very good coffee and even good soy coffee which is an achievement! We also had a chat to a couple of hikers who were doing the Bibbulmun. It is lovely encountering these people on the journey and hearing about their travels. I later realised that the lady said she was hiking up to 40km per day, end to end – which is similar distance per day to what we were doing on a mountain bike! We had seen them walk past our camp site while we were still making breakfast, at which time they would have already covered at least 10km. Streamlined efficiency there. At Donnelly River we were also treated to an encounter with an emu and his chicks – the chicks were so cute but the adult was more interested in food than anything else! Emu chicks, just part of the wildlife encounter at Donnelly River. There were also kangaroos and joeys! After lunch we were treated to more bush trails and more trees over the track. Annie was our expert track clearer and I was the bike holder and sometime assistant. The trail for most of the day was “easy” but I knew the last 4km was a “difficult” grade. I was hoping it would not be too steep or technical to ride. 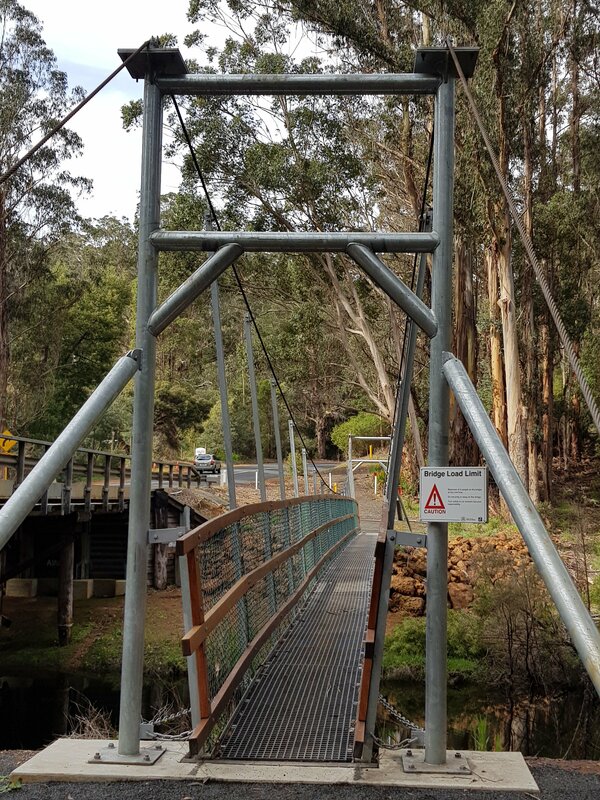 At the start of the difficult section at One Tree Bridge we encountered a suspension bridge. Annie went first – she seemed pretty wobbly on the bridge which is not like her. Then I started off and I thought gosh this is pretty easy. But after you get halfway across the bridge it starts to get a tiny bit of movement – hardly noticeable but just enough to throw you off course on a bike! Now I knew why Annie had been weaving all over the place! So we had started the difficult section. The trail quickly headed straight up a trail that was just too steep for me to cope with. Annie got about 5m further up than me, then we were both walking. It was only a short hill though, then back on rideable trails. The remainder of the difficult section, approx 2.5km until we reached the hut, was a switchback climb. I really enjoyed this – it was technical enough to be fun but achievable, and with an average gradient of 4.5% it was rideable even with 20kg of panniers. It took us 20 min to get through this section, then we finally reached the turnoff for the hut. We were at Karta Burnu hut, in a lovely location at the top of a hill. 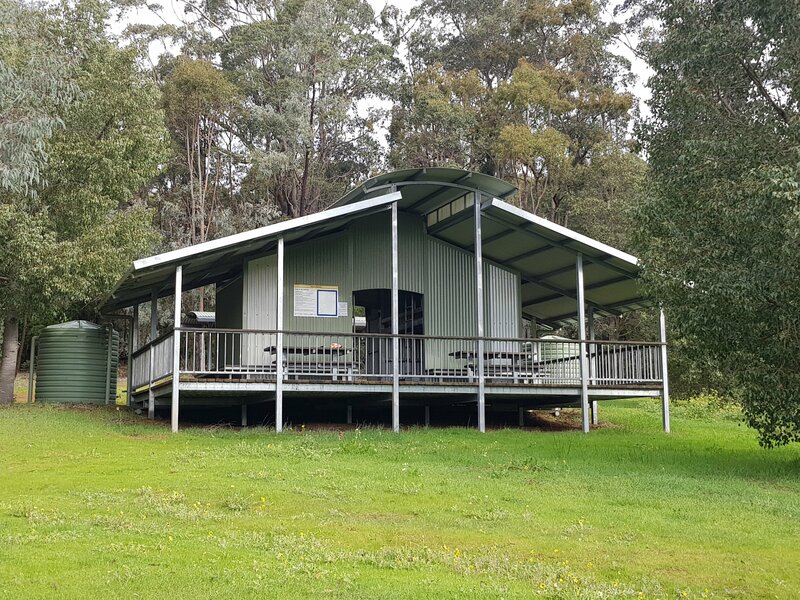 We were so pleased to reach a proper Munda Biddi hut with shelter over the tables, shelter over the bike parking, water tanks and a toilet. Karta Burnu hut, ah the serenity! We found a lovely grassy spot protected from the wind for our tent, and got that set up. We were just getting changed in the open hut when another rider appeared! 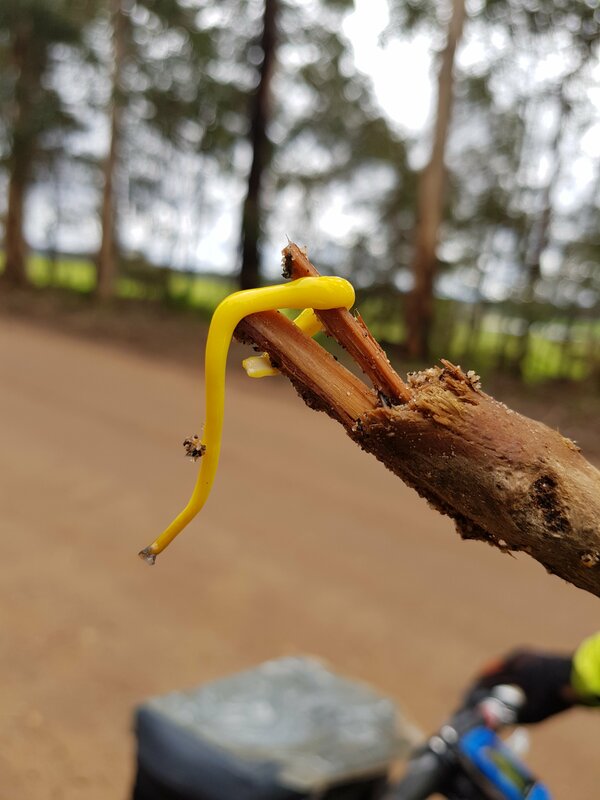 He had come from Nannup that day, so the same direction as us but 25km further. I hope he appreciated our trail clearing efforts! He also had bike packing gear (less weight) which would have helped with lifting over logs. We had rehydrated homemade Bolognese sauce for dinner. I had made dehydrated mashed cauliflower to have with mine. I learnt that wasn’t such a great idea – to start with, dehydrated cauliflower smells pretty bad. Plus it doesn’t really rehydrate into anything resembling cauliflower. It was ok mixed into the sauce but I won’t be doing that again. We were snuggled up in our tent by 7:30pm and it was very cosy with our two sleeping mats each (self inflating plus blue foam mat) and our lovely 2-person Enlightened Equipment quilt. I tried another experiment for breakfast on Day 2, and unfortunately this one was also a fail. I’d dehydrated egg and brought with me mushrooms so that I could make fried mushrooms and scrambled egg. The mushies cooked up ok, but the eggs didn’t rehydrate into anything resembling egg even after they had been rehydrated with water and mixed with milk powder and cooked. I also cooked them in with the mushrooms so everything ended up brownish. I managed to eat half of it before throwing the rest away. I then proceeded to feel slightly nauseous for the morning’s ride and I couldn’t even think about food for fear that I’d chuck up. No more dehydrated egg for me. 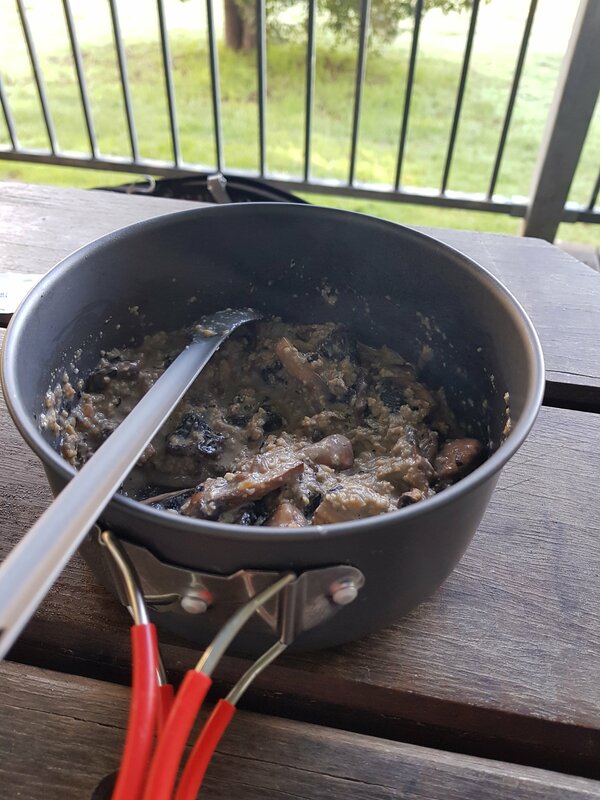 Rehydrated egg and mushrooms – not good trail food. At least there was a good view to distract me! A note on the weather. Friday it had rained a lot on the drive down, plus on and off during the ride and overnight. Saturday we didn’t have much rain to speak of, but the rain jackets were very handy to protect us from all the dripping wet shrubs we were ducking underneath or getting off the bikes to manhandle out of the way. Based on the weather forecast, we were expecting Sunday to be very rainy from mid morning. We had blue skies and sunshine when we set off, so far so good. 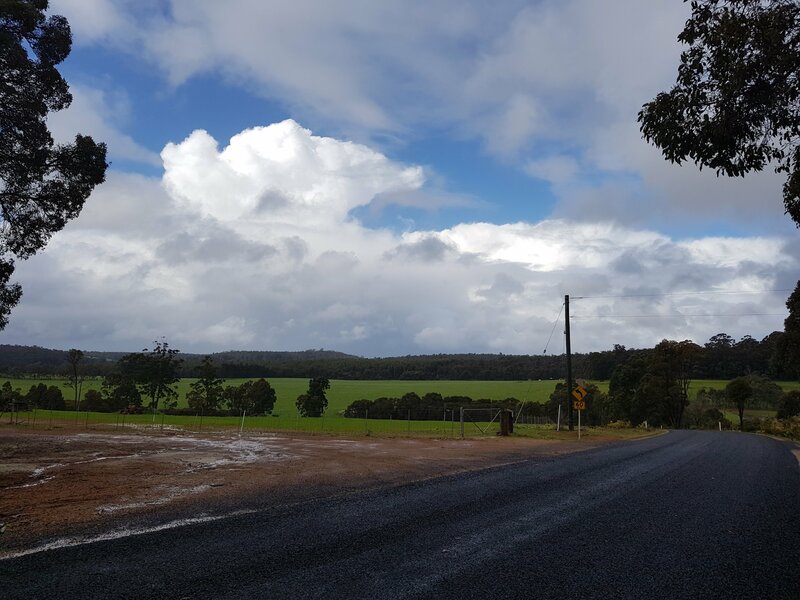 While we were having lunch in Manjimup the clouds started to roll in and we figured that was the end of the good weather. But our luck held out – we didn’t get any rain until we pulled into the campsite in the evening, then it proceeded to rain all night. But I’m getting ahead of myself. So we set off in sunshine on Sunday morning after our usual 2.5 hours to have breakfast and pack up camp. It was uphill to start with, along fire trails. We continued along mostly fire trails through the bush and farmland for about 13km, before reaching Deanmill. It was then 8km along a fairly flat bike trail to Manjimup. We arrived in Manjimup in time for an early lunch. Not being familiar with the town, we were looking around for somewhere to have lunch when a local asked us if we needed help. 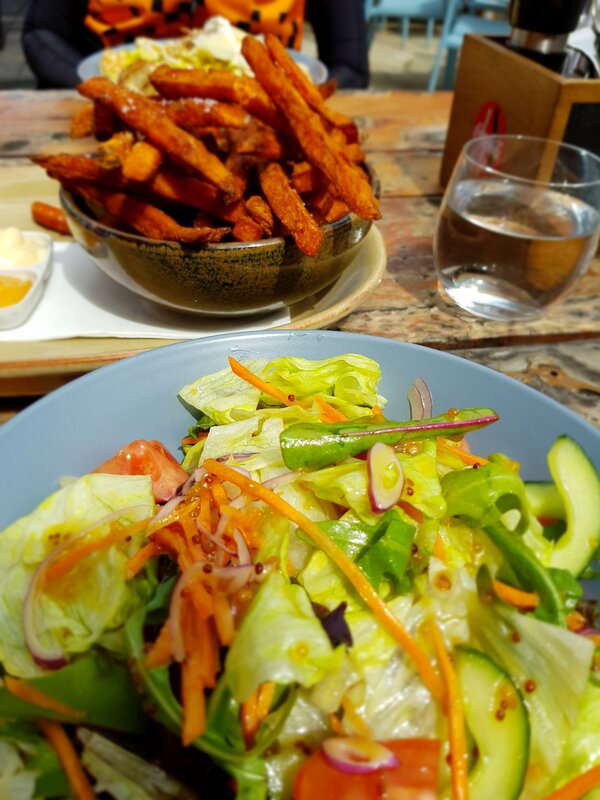 She then directed us to their flagship pub/ restaurant called Tall Timbers, and proceeded to liaise with management so we could bring our bikes into the alfresco eating area as there was nowhere to lock them outside. Suitably refuelled, and with the clouds rolling in, it was time to get on our bikes and ride! Next stop was Quinninup where we hoped to find somewhere to camp. 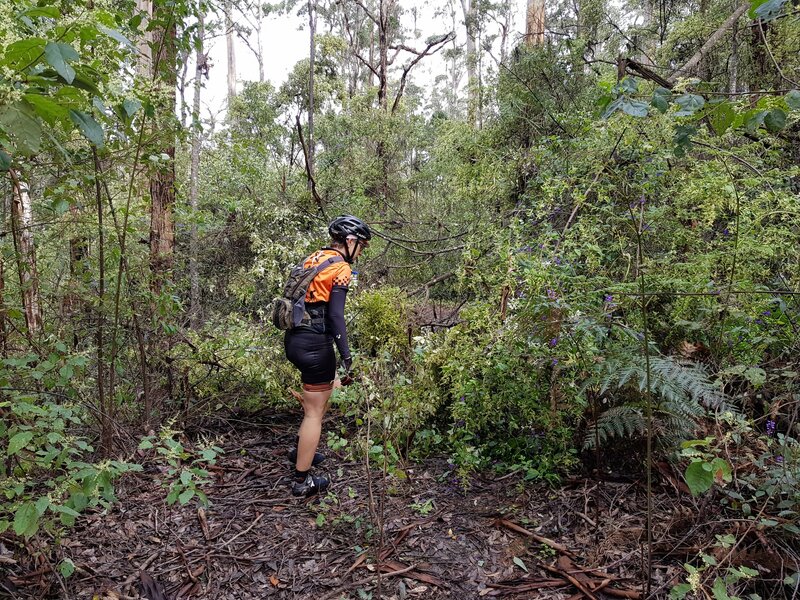 The trail took us through Manjimup, then onto bike trails through the forest for the next 20km or so. The vegetation had changed here, with less tall trees and more flowers in different colours, not just the yellow and purple we’d been seeing the past two days. After 20km we reached the point where the trail was diverted for 13km around a logging operation. It was not the nicest diversion. Although it started on gravel roads, we ended up on South Western Highway for about 5km on a narrow gravel shoulder, which wasn’t ideal. Finally we got off the highway and back onto the proper trail. We could tell it was the proper trail as we had a series of climbs to go up and down with heaps of strips of bark and sticks scattered all over the trail. Ah, back in the bush! So we arrived at Quinninup at about 3:30pm and the first thing we saw was a huge park with “no camping” signs, a visitor information centre and a series of noticeboards. So we looked at the noticeboards with the town map and Munda Biddi information, but there was no mention of accommodation or anywhere to camp. We tried the visitor centre but it was closed. So we started riding around the park hoping to find some secluded bush where we could pitch our tent. We found some locals and asked them about camping and they directed us to the caravan park. I didn’t realise Quinninup was big enough to have a caravan park! It was on the other side of town, past the turnoff for the Munda Biddi, and past the gutted ruins of the burnt pub. We arrived at Quinninup Eco Tourist Park and had just decided on the $20 tent site as opposed to the $90 chalet when it started to drizzle. Quick, pay the man and get the tent up! By the time the tent was up, the rain had set in. But we had the luxury of (a) hot showers, and (b) an enclosed camp kitchen. They also have a special breakfast deal for Munda Biddi riders, $15 for bacon, eggs, toast and cereal to cook your own breakfast. But after my egg failure for breakfast I wasn’t keen on this! Today we had ridden 58km with 690m of elevation gain in 4:20. Our average speed (13.6kph) was much faster due to the road sections and less blockages across the trail. After our hot showers we enjoyed the shelter of the enclosed camp kitchen to make our dinner and sit on real chairs. We stayed up late (8pm) reading magazines left by others. Upon turning out the light in the tent, we realized the light for the ablutions block was very bright – time to put the eye mask on that I’d been carrying for just this purpose! It was still raining quite heavily. I managed to sleep through the rain but not through Annie’s tossing and turning next to me. It was a restless night. It was still raining when we got up (early – around 6:30pm after lying awake since dawn at 6am). Breakfast in the camp kitchen (quinoa porridge) then get changed in the ablutions block and get all the gear packed. Everything seemed to take longer due to the rain and trying to avoid being out in it for too long, which was a bit foolish considering we would be riding in it soon enough. The tent was soaking wet so we did our best to tip the water off and get it packed. Good thing we wouldn’t need it tonight as we had luxury accommodation booked in Pemberton! We left at around 9am, prepared for a day of wet riding. The trail took us along a lovely section of singletrack to start with, some fun twisty bits with a bit of climbing. We continued on trails through the bush, then came out onto a gravel road. By this time the rain had stopped and I was working up a sweat under my rain jacket, time to take it off. A but further down the road, we saw an emu on the side of the trail with one crazy chick running all over the place. The emu was very defensive of his chick and came into the path and straight towards me. Good thing I’d heard at Donnelly River that you can scare them off by being taller than them. So instead of being afraid, I just looked him in the eye and stood my ground enough my arm up straight being tall. He back away but not far, he was still trying to protect his last chick. So we gradually herded the emu and his chick off the trail and far enough into the bush that he would let us pass! Heading along the gravel road beside some farms, we realised it was still pretty windy. The terrain was rolling, up and down hills. I was a bit chilly on the downhills but comfortable on the uphills so the jacket stayed off. Our plan for food today was to stop only for a snack as we didn’t want a long stop if it was raining. Plus we had only 40km to ride. 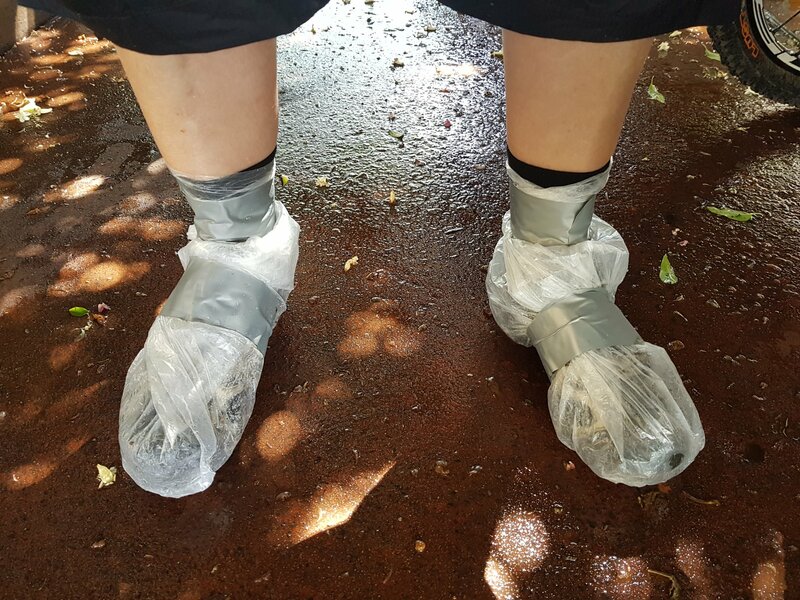 After 20km we were still on the gravel road but had entered the bush so we had some protection from the wind. Time to stop for food before my companion starts to fade away. I’d found I was not hungry much on the trip. I think perhaps because I was eating at meal times, even though I wasn’t hungry, and eating everything that I had prepared, even though it was more than I wanted. I actually put on a couple of kilos on the trip! So my snack was two rice cakes with butter, vegemite and cheese. I’d been so excited about this snack all trip but hadn’t eaten any snack food yet because I didn’t need it. So I really enjoyed eating this! The trail continued undulating up and down on quiet dirt roads through farmland and bush. We knew we were getting close to Pemberton when we started to see houses, and we thought that was the end of the bush. But the trail had a few surprises up it’s sleeve. After skirting the northern tip of the town, it took us further north and west along a bike trail through the bush and then roads through farm areas. Then for an extra special finale the trail took us along some singletrack that forms part of the Pemberton mountain bike park. We popped out into town at the local swimming pool, less than 500m from where we had parked at the caravan park, just as it started to drizzle. The weather was right on cue. We had ridden 40km in 3:20, averaging 12.2kph. In total for the trip we rode 160km in 14 hours, an average of 11.4kph. For our glamping, relaxed approach to bike camping it worked well to do this in three and a bit days. Arriving in Pemberton in the early afternoon, we were able to use a hose at the caravan park to wash the mud off our bikes. Then it was a matter of unloading all the bags, drying everything, and getting it all into the car. Then the exciting bit – checking into our spa room at the Forest Lodge Resort! If you haven’t been here, it is a hidden gem right off the highway just north of town, with lovely manicured gardens overlooking a lake. 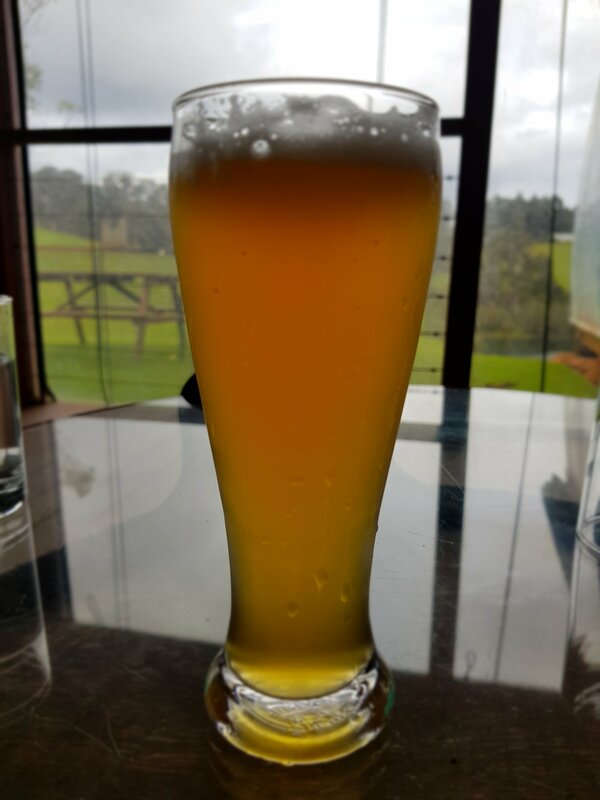 I was so preoccupied with having a shower and spa and then getting to the brewery before it closed that I completely neglected to take photos of the lodge! However I did get some photos of our breakfast there the next morning. 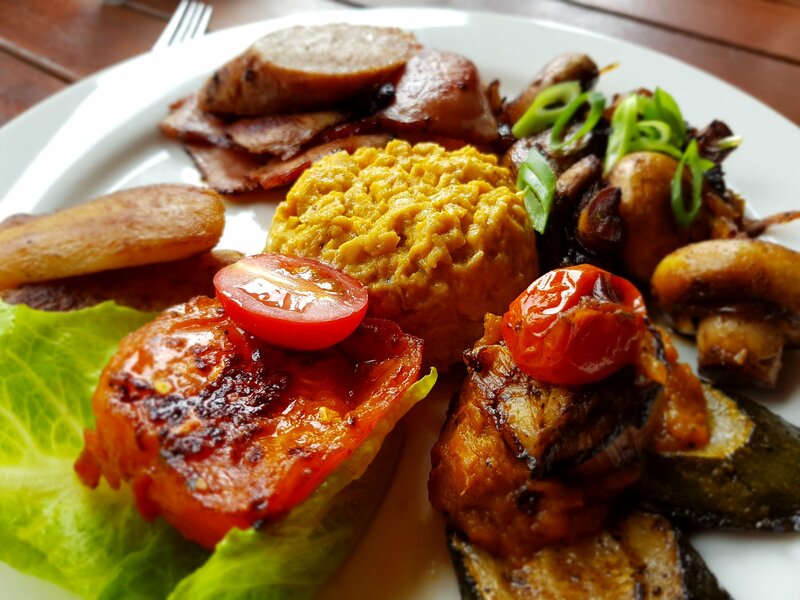 Well worth the extra $30 for a chef- cooked breakfast plus excellent continental options put on just for us! Breakfast of champions… I may have over indulged slightly! I’ve already starting planning the next Munda Biddi section to complete, from Pemberton to Northcliff and beyond! 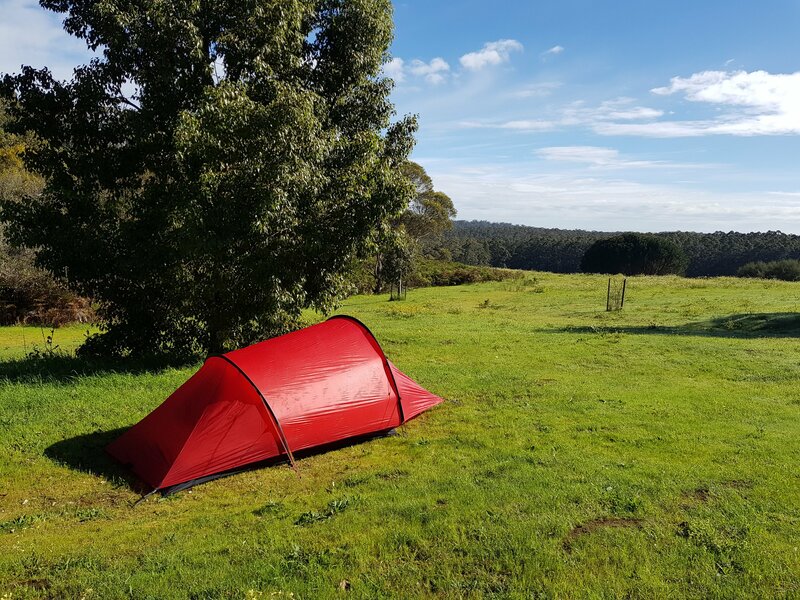 Tagged bike camping, mountain bike, munda biddi, off-road, recreational. Looks great! I would love to do the Munda Biddi one day. A friend recently did it all in one trip! Amazing! Lovely photos, especially the baby emu chicks! Thanks Anita! I found starting with one day trips, then weekend trips and extending from there was a good way to get started. End to end is a huge commitment! Yes sounds good. I have done a few days on there myself years ago, it is a great trail. We are very lucky to have it in our backyards!